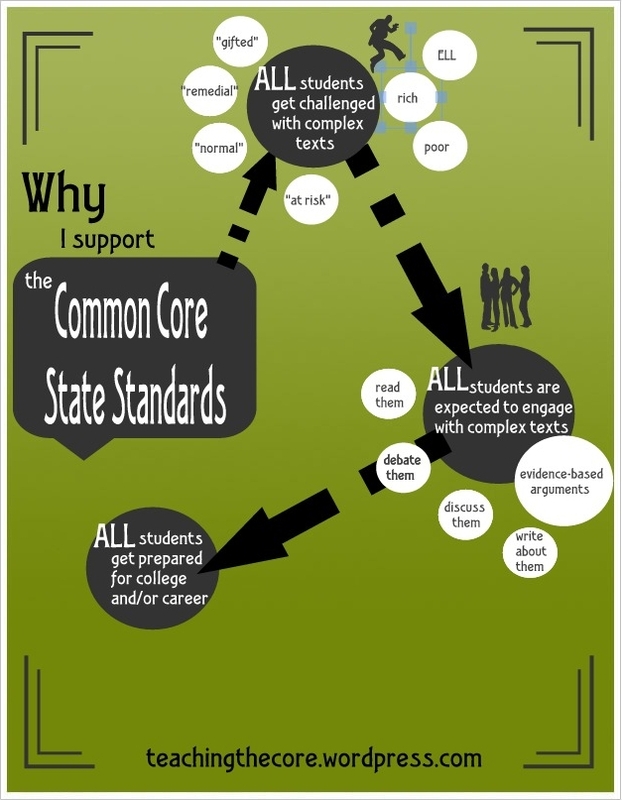 Why I Support the Common Core - Dave Stuart Jr. I'd bet a Galapagos Tortoise that no one decides to become a teacher based solely on the prospect of adhering to a list of teaching standards. So, here's a great question: why in the heck should we care about them? Here's an infographic version of this post that I created at Easel.ly. Those magic words terrified and electrified me. I felt terror because I could no longer blame a bogus curriculum for bad results, yet I was thrilled because I already knew that my students were capable and longing for so much more. I knew that, even though my students were allegedly the antithesis of their peers in “Gifted and Talented” classes, they could handle GT-level challenges. but I would also require us all to read books that were appropriate for the seventh-grade level. This meant that my students at a seventh-grade reading level would be challenged at a somewhat comfortable level, and my below-seventh-grade reading level kids would be much more challenged. Surprisingly, the second prong of my approach did not foment a revolt from my low reading level kids (at least, not for long). This is because there was a key resource in the room that enabled them to cope with complex texts: me. The CCSS simply believe that the key to raising reading levels is not merely giving each kid a book that is just above his/her reading level; rather, it's to give kids the chance, every year, to read books that are increasingly complex, regardless of where their skills are. In other words, even if a student enters ninth grade with a fourth grade reading level, he should still be taught how to grapple with a book like Bradbury's Fahrenheit 451. If this sounds cruel to anyone, that's because you might undervalue the power that a teacher can have in helping students learn to read texts that are well above their reading levels, and you also might undervalue a kid's desire to leap over a high bar. Not only do the CCSS require students to read complex texts, kids are also expected to argue about them, write about them, discuss them, analyze them, and make connections between them. Oh, and towards that end, kids are expected to know stuff; knowledge about the world is a key part of the CCSS. By the grace of God, education is moving away from treating reading comprehension like something that happens within a vacuum. We're done pretending that a kid from rural Wyoming can comprehend a story about sailing with the same ease as a kid from Salem. The end result is a text-rich, knowledge-informed, literate culture within classrooms around the country. The CCSS debunk the myth that if a student is not “the college type,” he/she will not need skills similar to those required by a college-bound student. The person who can't read complex texts, who can't make evidence-based arguments, who doesn't know how to listen and speak and use language effectively within a variety of settings isn't ready for college or work: he/she is just screwed. …even while I still don't love standards. I love the visual! It really sums it up! What an excellent post! I, too, support the CCSS for the reasons you mention, and I fully appreciate your support of teachers and their abilities to scaffold grade-level texts for students. Enjoyed reading your thoughts!